💡 Note that in one case it is an array of char, while in the other case it is an unsigned 32bit variable! That problem would not exist if that external declaration would be in a header file, but this is how the engineers have set up the startup and vector table files :-(. So the linker creates a virtual object and assigns it to the address 0x2000’0000. So for the vector table it is just a 32bit value (memory address), while in the startup code it is an array of char, and assigning the array name with a cast will take the address of that object and assign it to the local variable ‘addr’. While this ‘magically’ works, it is not correct, especially using an object as above with different declarations. At least it is not a clean way to use that symbol. With this, the linker is happy. And I’m happy too :-). 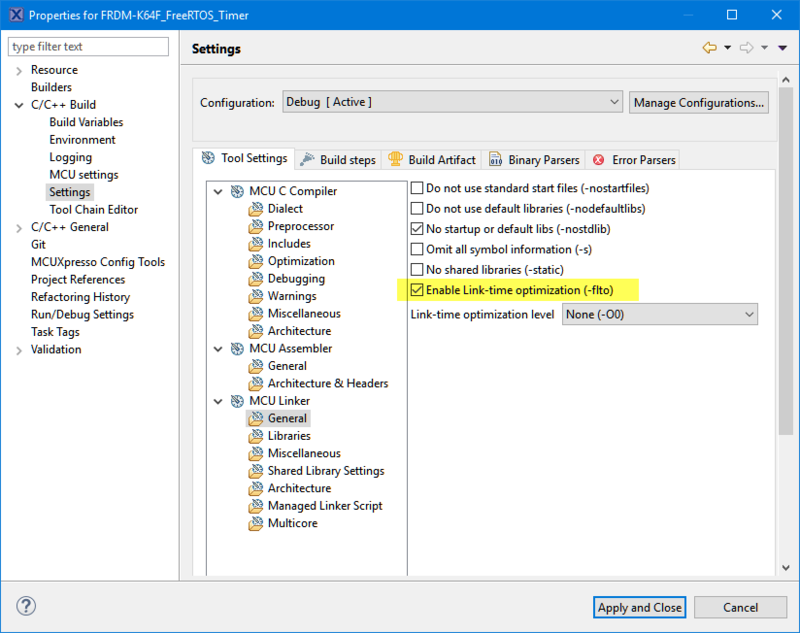 The above setting tweaks the FreeRTOS source base and makes sure that symbols needed for Kernel Awareness or symbols used in some assembly routines are not removed or tweaked by LTO. Link Time Optimization is a cool optimization. The optimization still has room for improvements, but I have found that with turning it on, it is able to flag hidden issues in the code. So -flto is as well an extra check for my code. 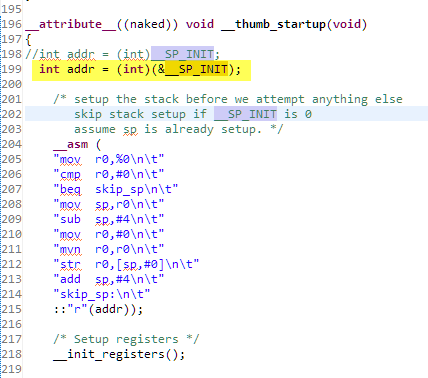 This entry was posted in ARM, Building, CPU's, Debugging, Eclipse, Embedded, gcc, Kinetis, MCUXpresso, MCUXpresso IDE, NXP, Processor Expert, Tips & Tricks and tagged -flto, ARM, arm gcc, Assembly, Debugging, Eclipse, FreeRTOS, GNU, gnu gcc, Link Time Optimization, LTO, open source projects, software, software project, technology, Tips&Tricks, tool chains by Erich Styger. Bookmark the permalink. So the uint32 would still be wrong. LTO can be aggressive and remove code that it thinks is unneeded yet is used such as interrupt code. 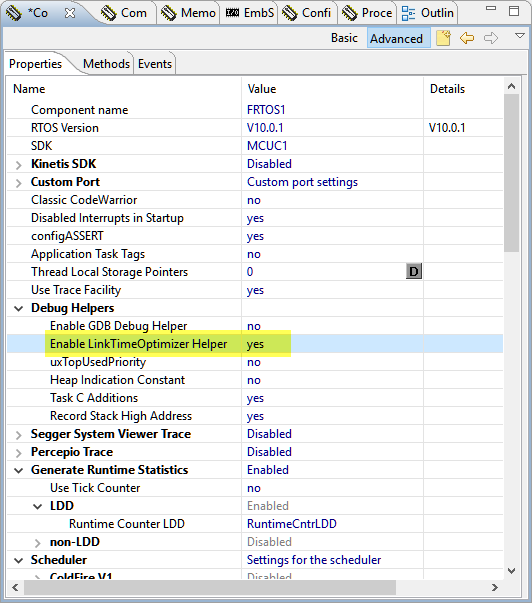 Unless debugging is an obsession, and not using FreeRTOS ‘helpers’, mark such code or variables with __attribute__((used)) to prevent them from vanishing. good reminder about stack 8-byte alignment. I have this usually done implicitly in the linker file, pointing the stacktop/start to the end of memory which usually is 8-byte aligned. And yes, LTO can be agressive and replace/remove symbols. I have used the __attribute__((used)) for this in several places. I had a typedef with an #ifdef modifying the type based on the some configuration options. The problem was, that this #define was placed in a header, which was not included everywhere the type was used. Only the LTO-warning described here detected this issue!